Scientists believe that the recent explosions in jellyfish populations are the reflection of a combination of factors. The severe overfishing of their natural predators - such as the tuna, sharks and swordfish - rising sea temperatures (caused in part by global warming), and years of man-made pollution that has depleted oxygen levels in coastal shallows. . Although there have already been beach closings due of jellyfish swarms on the Côte d'Azur in France, the Great Barrier Reef of Australia, and at Waikiki and Virginia Beach in the United States, it is the threat to the world's fishing industry which is considerably more worrying. Swarms of jellyfish are now seen to be hunting in packs, able to decimate large numbers of fish. Because jellyfish are both slow moving and semi-transparent, they are able to get relatively close to unsuspecting fish without them realizing the danger. Given the opportunity, they ensnare the fish in their poisonous tentacles and are able to dissolve the bodies in their stomachs within minutes. In Japan - which is home to the world's largest fishing industry - fishing boats are regularly catching jellyfish in their nets instead of fish. Sometimes it’s both, but then any fish caught along side large numbers of jellyfish are so full of venom they are rendered inedible. 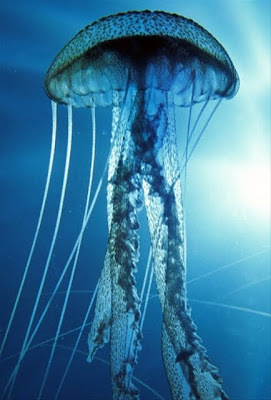 The Nomura's Jellyfish, commonly found off the coast of Japan, has a body that can weigh as much as 200 lbs and grow as long as 2 meters - not including the length of their tentacles. According to estimates by the Japanese government, this plague is 100 times the size of normal Nomura's Jellyfish populations and they are now taking aggressive actions. The Japanese fishermen have begun the practice of chopping up netted jellyfish and dumping their bodies back into the sea, but the Japanese government are taking matters further by creating a committee and a task force dedicated to hunting down and destroying jellyfish in order to protect the other fish that makes up their livelihood. Unfortunately the practice of chopping up jellyfish may be making things worse. When jellyfish are under attack or killed, they release millions of sperm or eggs, which if return back to the sea can produce yet more jellyfish. So what can be done about the jellyfish problem? Create fishing amnesties around the worst affected areas; place an international legislated fishing ban on the natural predators of jellyfish? Promote jellyfish as a ‘new’ delicacy for the Asian market? At the moment there are few answers forthcoming, but unless our burgeoning populations wake up to the problems of climate change, pollution, overfishing and the unsustainable consumption of the world’s resources - catastrophe is inevitable. Giant Jellyfish Swarms – Are Humans the Cause?